Garage: "Garage - Attached, Heated, Open, Tandem"
Year Built: 1954 "Updated 1998"
Experience enchanted living in this luxurious custom-built lakefront home set in a verdant grove of pines & oaks on Indianwood Lake, an 82-acre aquatic paradise in northern Oakland Cnty. Two-story pillars anchor the front entrance of this 3,300+ sq.ft. beauty nestled in an idyllic locale of nearly an acre populated by ferns, hostas & Japanese maples. The exclusive residence’s stone fireplaces & peaked roofline draw eyes upward as the massive rough-hewn stones of its lush landscape keep you rooted to the earth. Over 100 ft. of tranquil terrain border Indianwood Lk, where a sandy beach & boat dock connect to watersports & wildlife. Gorgeous terraced-stone steps lead from the private beach, past an inviting hot tub, to the spacious deck, perfect for entertaining guests as they gaze at breathtaking lake views. 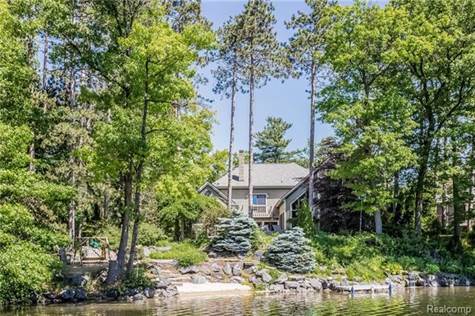 A tranquil/friendly neighborhood minutes from schools, shopping, public parks & bike trails, libraries, historic Indianwood Country Club & public access to all-sports Lake Orion.